HSM SECURIO C14s Strip-Cut Shredder: The Best For Everyday Use! Many people now a days are highly concerned about the safety of their information. Sensitive information is stored away in a wide variety of storage media on which we are highly dependent. With the growth of a rather unfortunate trend of data theft and espionage, the issue of data security is something we all need to take care of. HSM has been on the forefront of data security industry and is the market leader in developing suitable products for users around the world. The HSM SECURIO product range is specifically dedicated to catering the needs of offices and busy organizations. A part of this series is the HSM SECURIO C14s Strip-Cut Shredder, the best shredder for everyday use in small offices and at an economical price. SECURIO C14s Strip-Cut Shredder boasts an impressive range of specifications that exactly meet the requirements of its market. A significant throughput is guaranteed by its sheet capacity of up to 12 sheets and incredible shredding speed of 8.66 feet/min. 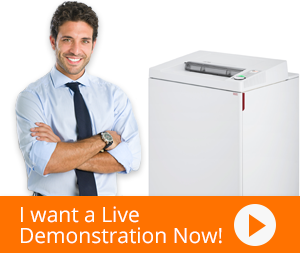 With these capabilities, one can shred big piles of paperwork in a matter of seconds. Moreover, the HSM SECURIO C14s can accommodate all officially used paper sizes with its 8.86” wide feed throat. This means that there is no need to fold sheets at the expense of sheet capacity, just so they fit into the throat. SECURIO C14s Strip-Cut Shredder also has a sizeable 5.28 gallons waste collection compartment. The bin is easy to remove and empty, and helps maintain a clean work environment. Built to suit the needs of office users, SECURIO C14s Strip-Cut Shredder has been integrated with numerous features that make it intuitive for them. Offices are busy workplaces where people are in a hurry to get their work done. The same goes for shredding. However, most shredders get jammed when the operator is in a hurry as he/she tends to overload the feed. HSM SECURIO C14s has the perfect solution to this problem in the form of overload protection. It informs users when they are about to overload the shredder up to the point of jamming, which helps them optimize workload and avoid jams, that are time-consuming to remove. Furthermore, HSM gives due importance to the environment and has incorporated an energy-saving standby mode in this shredder which consumes no power at all when activated. HSM SECURIO C14s Strip-Cut Shredder is, owing to its superior qualities, certainly one of the best of today and what everyone concerned about data security needs by their desk side.